Arrival to Istanbul airport and catch a connecting flight to Kayseri or Nevsehir. Drive to Cappadocia. Dinner & overnight. Breakfast at the hotel, morning visit to the underground city of Kaymaklı & Citadel of Uçhisar. After lunch continue with the valley of “Goreme” & open air museum. The last sites will be Pasabag valley and Avanos. Return to hotel for dinner & overnight. Early in the morning, we drive to Konya stopping by and viewing the Seljuk Sultanhani Caravanserai on the way. We visit the Mausoleum of Mevlana in Konya. Lunch will be served on the way. Arrive in Pamukkale and enjoy the sunset with its unique formation of petrified calcium cliffs. Dinner and overnight. After breakfast, we visit the ancient city of Hierapolis in detail. Necropolis, Nymfaeum, Main Street and calcified travertine. Continue to Kusadasi for dinner and overnight. In the morning, we visit the house of Virgin Mary. Continue to the Ionian city of Ephesus, the Roman Capital of Asia Minor. 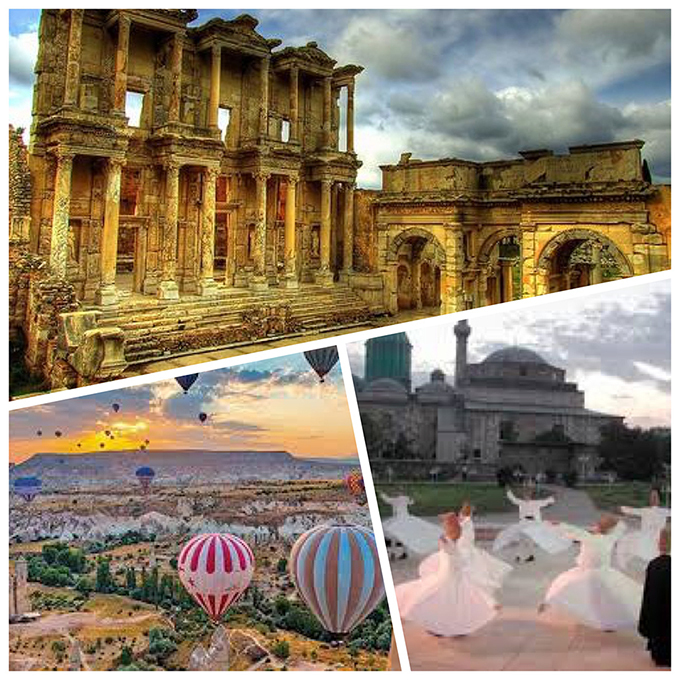 We visit the ancient city covering Bouleterion, Prytaneum, Celcius library, Hadrian’s temple and theater..We will enjoy a fashion show on leather goods during the day. 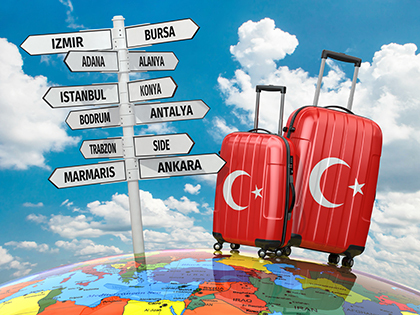 Drive to Izmir airport for your flight to Istanbul. Transfer to your hotel for overnight. After breakfast visit to St. Sophia Museum which is one of the great architectural marvels of the ancient world. We continue on to the Hippodrome, the sportive and political center of the Old City to see Egyptian Obelisk, Serpentine Column and German Fountain. Afterwards, we visit the Blue Mosque, facing St. Sophia and famous for its delicate blue tiles, and unique 6-minaret design. We then visit Topkapi Palace, seat of the Ottoman Empire for four centuries and visit the Treasury. Last stop will be Grand Bazaar. Transfer to Istanbul airport and end of our services.